As the climate gets warmer, arid soils lose nitrogen as gas, reports a new Cornell study. That could lead to deserts with even less plant life than they sustain today, say the researchers. "This is a way that nitrogen is lost from an ecosystem that people have never accounted for before," said Jed Sparks, associate professor of ecology and evolutionary biology and co-author of the study, published in the Nov. 6 issue of Science. "It allows us to finally understand the dynamics of nitrogen in arid systems"
Available nitrogen is second only to water as the biggest constraint to biological activity in arid ecosystems, but before now, ecologists struggled to understand how the inputs and outputs of nitrogen in deserts balance. By showing that the higher temperatures cause nitrogen to escape as gas from desert soils, the Cornell researchers have balanced the nitrogen budget in deserts. They stress that most climate change models need to be altered to consider these findings. Sparks and lead author Carmody McCalley, a graduate student, warn that temperature increases and shifting precipitation patterns due to climate change may lead to further nitrogen losses in arid ecosystems. That would make arid soils even more infertile and unable to support most plant life, McCalley warned. Although, some climate models predict more summer rainfall for desert areas, the water, when combined with heat, would greatly increase nitrogen losses, she added. "We're on a trajectory where plant life in arid ecosystems could cease to do well," she said. In the past, researchers focused on biological mechanisms where soil microbes near the surface produce nitrogen gas that dissipates into the air, but McCalley and Sparks found that non-biological processes (abiotic) play a bigger role in nitrogen losses. They used instruments sensitive enough to measure levels of nitrogen gases in parts per trillion that had never before been applied to soil measurements. 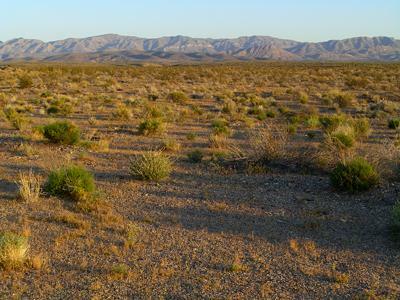 The researchers covered small patches of soil in the Mojave Desert with sealed containers to measure nitrogen oxide (NO), NOy (a group of more than 25 different compounds containing oxidized nitrogen) and ammonia gases that escape from desert soils. To rule out the role of light in this process, McCalley kept light constant but varied the temperatures in lab experiments. "At 40 to 50 degrees Celsius [about 100-120 F], we found rapid increases in gases coming out of the soil" regardless of the light, McCalley said. 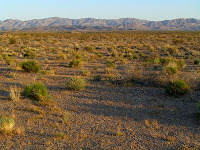 Midday ground temperatures average about 150 F and can reach almost 200 F in the Mojave Desert. "Any place that gets hot and dry, in all parts of the world, will likely exhibit this pattern," said Sparks. In addition, the researchers note, more nitrogen oxides in the lower atmosphere creates ozone near the ground, which contributes to air pollution and increases the greenhouse effect that warms the planet. With deserts accounting for 35 to 40 percent of the Earth's surface and arid and semiarid lands being the most likely areas for new human settlements, air quality issues, loss of soil fertility and further desertification need to be considered as the climate warms, the researchers said. The researchers also point out that most climate modelers now use algorithms that only consider biological factors to predict nitrogen gases coming from soils. "The code in climate models would have to change to account for abiotic impacts on this part of the nitrogen budget," McCalley concluded.